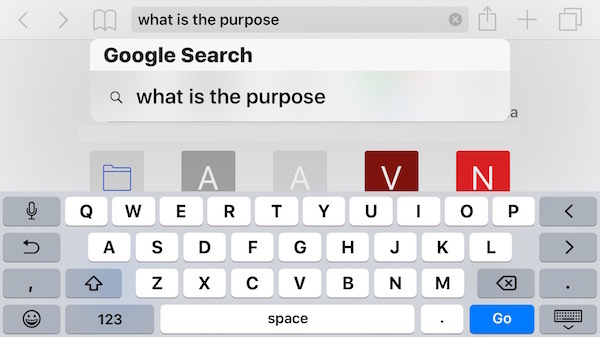 When typing something into the search bar of Safari on the iPhone and iPad, you’ll see a list of suggestions popup underneath the address bar, offering completions, related searches, and something called Safari Suggestions. Sometimes these are really helpful as they can help search and access things on the web quicker, but sometimes the suggestions are way off, unrelated, or worse. iOS makes it easy to adjust whether or not you see those suggestions however, and we’ll show you how to turn off the Safari suggestions in iOS. 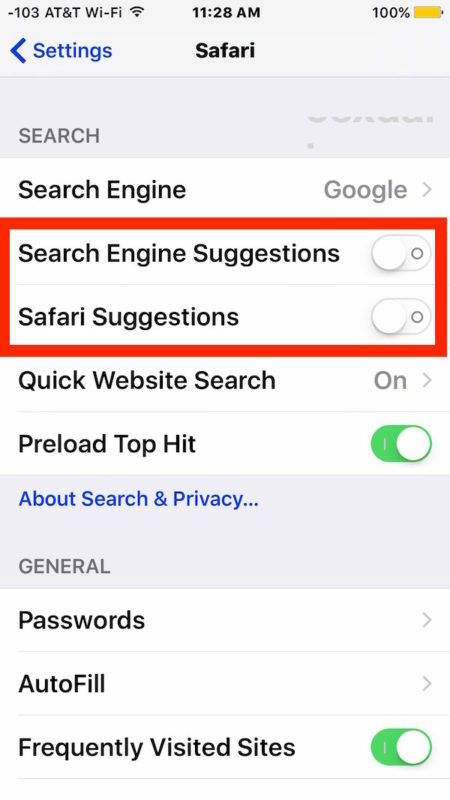 It turns out there are actually two different features with two different settings adjustments, one specifically for search suggestions, and the other for the Safari Suggestions. You can disable both if desired, or just one or the other, and of course this can be reversed at any time if you decide you want the suggestions back again. Whether or not you like the suggestions feature likely depends on your experience with them. Sometimes the feature is great and highly accurate, whereas other times it leaves much to be desired as completely unrelated material is suggested by Safari in iOS (like the screen shot example up top). Safari Suggestions in iOS seem like a good idea; you type something in the Safari search bar on your iPhone or iPad, and what you type offers suggestions of completions and related content found on the web. Or at least, that’s how it’s supposed to work. But sometimes you may find that Safari Suggestions are so bad and so inaccurate or off topic, that it borders on trolling. 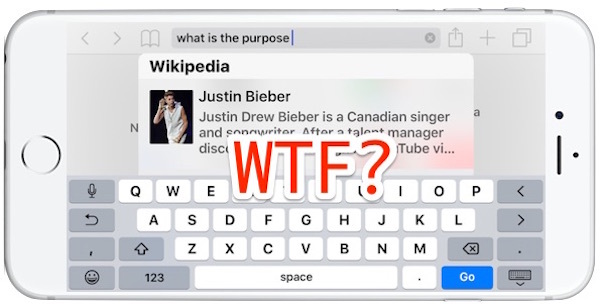 Here is one such example: on iPhone, typing “what is the purpose” in the Safari iOS suggestions bar offers up… wait for it… a Wikipedia article on … Justin Bieber?!? It sounds like a joke, but it isn’t, this is actually what my iPhone is offering me as a suggestion for that phrase entered into Safari. Odd to say the least! If you don’t like the feature on the iPhone and iPad, you may also disable Safari search suggestions on Mac OS X as well. I tried your Search setting suggestions and then used your example to test it. Your suggestions did not work. 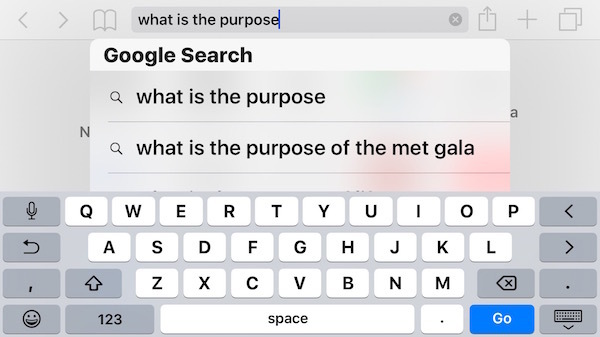 As soon as I typed a “w” Safari gave me a Top Hits suggestion that has no “w” in it, the Google search of w, and 5 Bookmarks and History suggestions. Maybe you’re not a Belieber? I get weird stuff popping up for my searches in Safari all the time too, things like you don’t even imagine. Who searches for this stuff? I don’t know, maybe you do Nick? I think Apple is trolling with the Safari Suggestions. 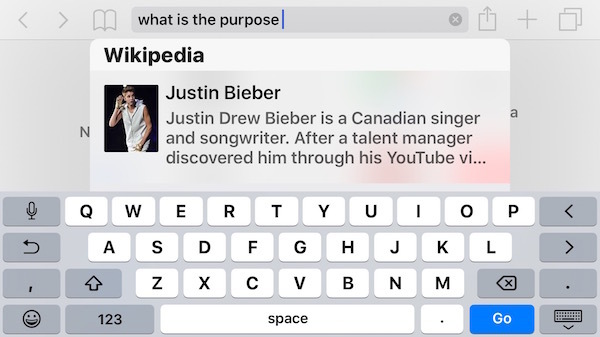 Recommending Justin Bieber for a web search that’s totally unrelated? It has to be trolling. And while that’s funny, it’s also very unprofessional for Apple to be engaging in trolling. Siri is also known for trolling, which makes Siri even less reliable than it already is. As soon as I changed my default search engine from google (initially to yahoo and then to duckduckgo), and removed the google option from my search engines list, I had no problems with any suggestions. In fact, by doing so my search results are way better and by far less commercial-oriented than the c##p I used to get from google. Don’t know why you are telling people to turn off Safari suggestions. How is Tim “Dancing w my EarPods!” Cooke going to keep distracting Apple customers with his progressive SJW bullcrap if you don’t click on his suggested links?! Your complaints seem to imply Apple is wasting our time with this crap instead of getting down to making serious improvements to the iOS and upgrade-desperate Apps like Contacts! Tried the instructions as written – disabling every possible search feature still has absolutely no effect. Still shows suggestions from bookmarks and ‘top hits’. Toggling the taps has no effect whatsoever. Since iOS 10.2 update the App suggestions in safari keep popping up. No way to turn them off. Very annoying. I did send bug report to apple. I figured it out. The reason people can’t get all search results off the phone is because you are only clearing the iCloud data when saying delete history. Settings -> ICloud -> Scroll down to Safari and turn it off. You will get a question asking if you want to delete all data. Say yes. Turn it back on. Back back to Safari and type a letter like “S” or “B” and you won’t get anything. The only problem with doing what I just said is it deletes all your bookmarks. If you turn ICloud back on, then the bad suggestions re-appear. I’ve since turned off iCloud in Safari and I’ll have to re-load my bookmarks. You can restore the bookmarks from the ICloud web site, and turn off Safari in the iCloud, but the suggestions still appear. There has to be a bug because it’s getting suggestions from bookmarks.